Hairline engraving. A technique used in metalwork where a design was engraved on a surface in a sequence of fine lines, using a burin. One of the oldest techniques in metal carving, its name derives from the hairline fineness of the lines. Commonly found on ornamental metal fittings such as nail covers *kugikakushi 釘隠し, and door pulls *hikite 引き手. The burin used for kebori was known as shibutagane しぶ鏨, and had a sharp point, making either 'V' or 'U' shaped grooves in the surface. Examples of hairline engraving have been found as early as the Yayoi period on bronze ware, and the technique was widely used in the Kofun period on horse trappings and weaponry. 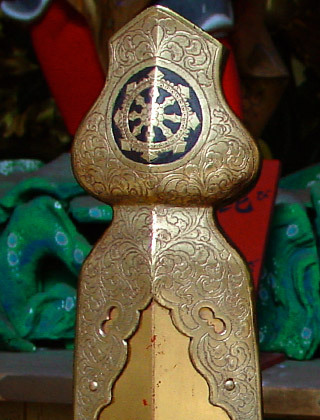 In the Asuka period the technique was used to decorate Buddhist statues and implements. A particularly famous example of the technique surviving from the Nara period can be seen on the lotus flower petals on the pedestal of Toudaiji *Daibutsu 東大寺大仏 in Nara.